The NHL's debut on Xbox Live, delayed by the league's 119-day lockout, finally arrived today when NHL GameCenter became available for download. Though the app itself is free, watching live games (broadcasts outside of your local TV market) requires a $49.99 subscription when play resumes tomorrow . The price was cut by more than half of its usual full-season price in light of the work stoppage that shortened the season to 48 games from 82. Other features are free of charge. 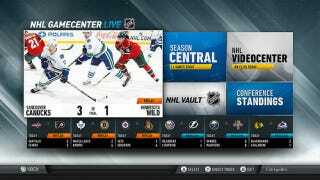 NHL GameCenter has been available on the PlayStation 3 since 2010, and also is available for Android and iOS mobile devices. The Xbox 360 version features Kinect-enabled controls for surfing current games, highlights, and a vault of 800 games going back to the 1960s, among other features.